The 30th-anniversary tour of Fame the Musical is set to stop in the West End next year as it celebrates three decades since the original Miami production. Based on the ‘80s hit film, Fame the Musical tells the story of students at New York City’s High School of Performing Arts and takes you on a journey of ambition, love and heartache as we experience the highs and lows of a group of students on their mission for the ultimate reward for hard work and sweat – fame. But Fame costs. Can these kids survive the pressures that threaten to run them off-course? The young hopefuls give it their all with breathtaking dance routines and a feel-good factor that lasts a lifetime. Take a trip down memory lane as the kids belt out show stoppers such as There She Goes/Fame! Bring on Tomorrow and Pray/Hard Work. Following the success of the film, and a six-season TV series that followed, the musical was developed by David De Silva and premiered in Florida in 1988 with music by Steve Margoshes and lyrics by Jacques Levy. The production will run at the Peacock Theatre from 11th September to 19th October 2019. 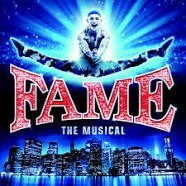 Fame was first seen in the West End in 1995 at the Cambridge Theatre, where it was nominated for three Olivier Awards. It subsequently ran at the Victoria Palace, Prince of Wales, and Aldwych Theatres. The show was last seen in the West End in 2007 at the Shaftesbury Theatre, starring Natalie Casey and Ian H Watkins.